The Borzoi (or Russian Wolfhound) originated in Russia and was bred as a hunting dog, using its excellent speed and sight to chase and run down foxes, hares and wolves. The agility and strength of the Borzoi lent itself perfectly to the great hunting traditions of the Russian aristocracy. This unique animal normally lives to ten years of age, but Borzois have been known to live up to 12 years of age when fed the correct nutrition. This is a tall dog with a typical female being 65cm to 70cm tall and weighing up to 35kg while the male grows up to 85cm and weighs 48kg. 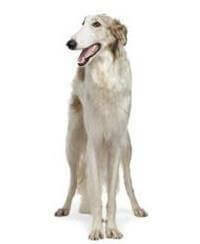 A primary part of Borzoi care is the importance of regular exercise. These dogs need to visit open spaces such as parks or the beach, where they can be exercised ‘off leash’. It is vital for the physical and mental wellbeing of this breed that regular exercise be maintained. Ideally, the Borzoi needs a large back yard, although this can be compensated for with long daily walks. As with all dogs, the Borzoi requires regular veterinary checks and lots of loving care. Borzois are agile dogs that need adequate fencing in order to keep them safely enclosed, particularly in the city. Similar to other large dogs, Borzois are occasionally prone to ‘bloat’. Consult the breeder of your dog or your vet for additional information. Although this breed is quite capable of undertaking basic obedience training, it is generally not responsive to specialist training.